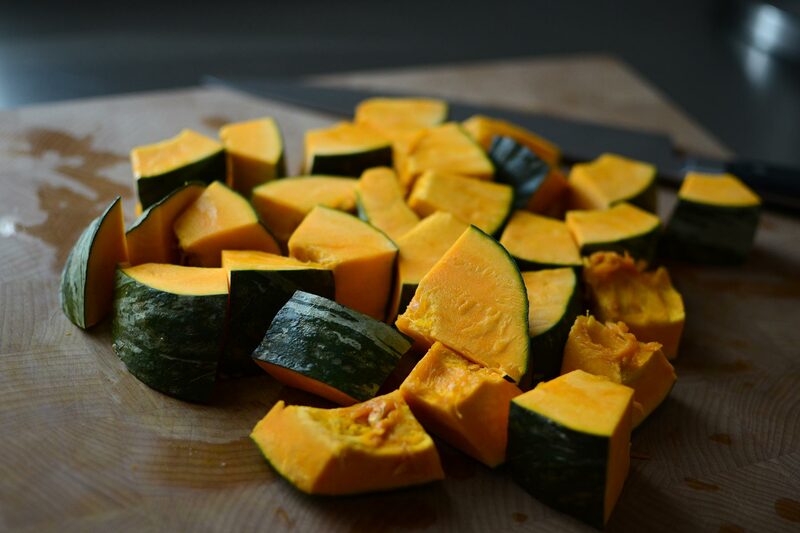 Kabocha in a Black Shallow Bowl By Shumpei Yamaki: Are You Eating the Skin? When I was 5 years old, a guest stayed at our little apartment in Japan. In the morning, my mother served the usual breakfast of grilled salted salmon with miso soup and rice. Seeing that the guest carefully removed the skin of the salmon and left it on their plate, my young unfiltered mouth blurted out: “wah, you don’t eat the skin? It’s really tasty you know, it’s the best part…what a waste (mottainai)!”. My mother to this day talks about this episode and how embarrassing it was for her because it was obvious that I wanted the guest to give me the salmon skin if they were not eating it. And for a long time after the incident, there was an uncomfortable glare coming from my mother whenever I sat down with guests at the dining table. 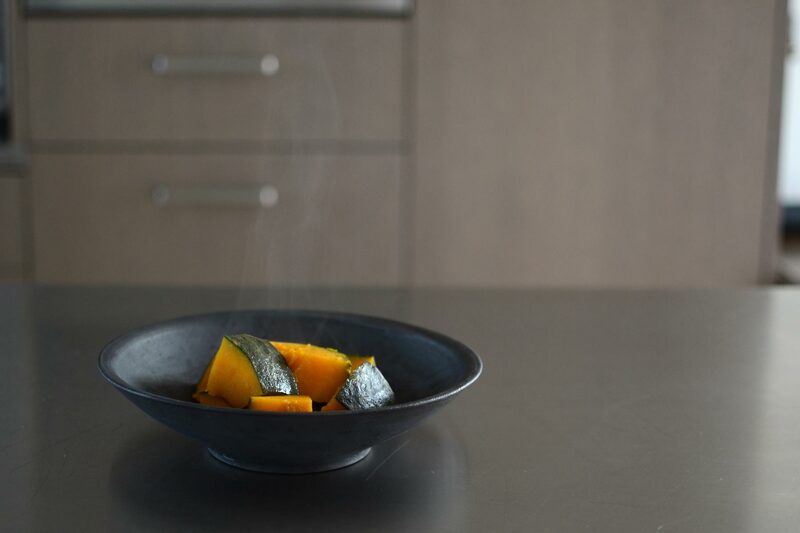 Kabocha pumpkin in a wood-fired black bowl by Shumpei Yamaki. Black is a great background for colorful fall vegetables and fruits. Speaking of skin, the other food that I like to eat right now with skin are the kabocha pumpkins that are coming into season. 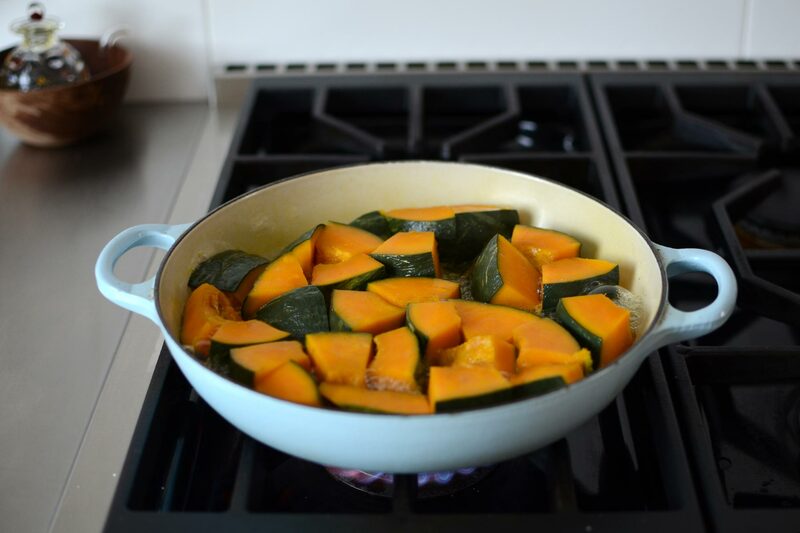 To prepare kabocha, I cut them up into generous chunks with the skin and put them in a shallow braising pan in a single layer. Then I add about ¼ -½ inch of water, drizzle a little olive oil, and sprinkle salt, cover and boil for about 10-12 minutes. The key is that there is enough water to boil and slowly reduce. After turning the stove off, all the water gets absorbed into the pumpkin leaving no liquid. I prefer this simple preparation to the normal Japanese recipe that calls for sake, sugar and soy sauce because I find that recipe too sweet. Cooking in a braising pan with just enough water to be absorbed back into the pumpkin pieces. The result are firm chunks of delicious pumpkin pieces that can be eaten hot or cold. And the best part is the contrast of texture between the skin and the pumpkin meat! Whenever I’m served peeled kabocha, I say loudly in my head “mottainai“! And, you may be surprised that there are things that people eat with skin in the US that almost all Japanese don’t, such as peaches. The first time I saw my husband eat peaches with skin, I was horrified. Japanese generally like to eat fruit without skin, and I should do some research as to why this is for another blog post. In the meantime, enjoy your kabocha with skin, and maybe also your salmon skin? Otherwise, MOTTAINAI! Kabocha pumpkin. Don’t remove the skin it’s the best part!